Lessons should be learned from problems with a French reactor that is very similar to one planned in the UK, says Britain's nuclear safety regulator. French regulators have been informed of "manufacturing anomalies" in components "particularly important for safety" at Flamanville 3 power plant, in Normandy. EDF Energy - involved in both projects - said a new series of tests was under way and it was working with regulators. Areva, which is building Flamanville 3 for EDF, says it is the first plant in the "new French reactor fleet", and it includes Areva's new EPR reactor. The UK Office for Nuclear Regulation said it was aware of the French Nuclear Safety Authority's concerns about the reactor and would continue to liaise with French authorities. "The UK currently have no EPR reactors but expects that learning from Flamanville 3 will be taken into account in the manufacture of components intended for the planned new reactor at Hinkley Point C," it said. The final decision on the project is expected in the coming months but is also delayed by Britain not having a fully functioning government - something which could be exacerbated if talks on forming a government drag on after the election. 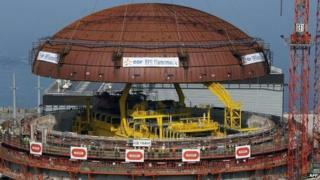 In a joint statement, Areva and EDF said new tests were under way on the "reactor vessel head and bottom". It said this followed initial tests which had shown "greater than average carbon content" - something French regulators said caused "lower than expected mechanical toughness" in the steel. EDF and Areva added: "Teams are working to perform the additional tests as soon as possible, following approval by the French Nuclear Safety Authority on the test conditions, and to provide the safety authority with all the necessary information to demonstrate the safety and quality of the corresponding equipment."